It used to be that we’d strategically place slices of juicy orange mango, bright golden green kiwi, honey-hued bee pollen and the passionate red of strawberries to cover the distinctly boring aesthetic of the pallid porridge oats that lay beneath. But now, there’s been an instant lift to breakfast colour palettes everywhere, with the vivid fuchsia tint of a new hipster breakfast: pitaya bowls. Move over porridge, there's a new health bowl in town. Pitaya - the fancy name for dragon fruit - is a superfood, with every part of the fruit proving beneficial to the body. The seeds contain fatty acids, the edible skin is filled with magnesium and the fleshy bit on the inside is jam-packed with nutrients, including vitamins C and B. In basic terms, all these things mean that dragon fruit is really great for weight loss and preventing high blood pressure. But perhaps the best bit is that you feel like you’re eating an actual rainbow. The intensity of the colour in this popular breakfast bowl is definitely the most Instagram-worthy meal you’ll eat all day, we promise. However - and sorry to disappoint - the taste of pitaya is in stark contradiction with the bright colour of the fruit. It’s still crazy delicious, but it has more of a mild, sweet flavour, not dissimilar to melon or kiwi. The really great thing about this fruit is it literally goes with anything. Chuck a bit of greek yoghurt in there, some tropical fruits, or even a few greens such as kale or broccoli, and it’ll still be delicious - without turning your food that hideous green colour. To make a pitaya bowl, you can buy the dragon fruit yourself or, if you’re lazy like us, you can pick up pitaya smoothie packs from health food stores. 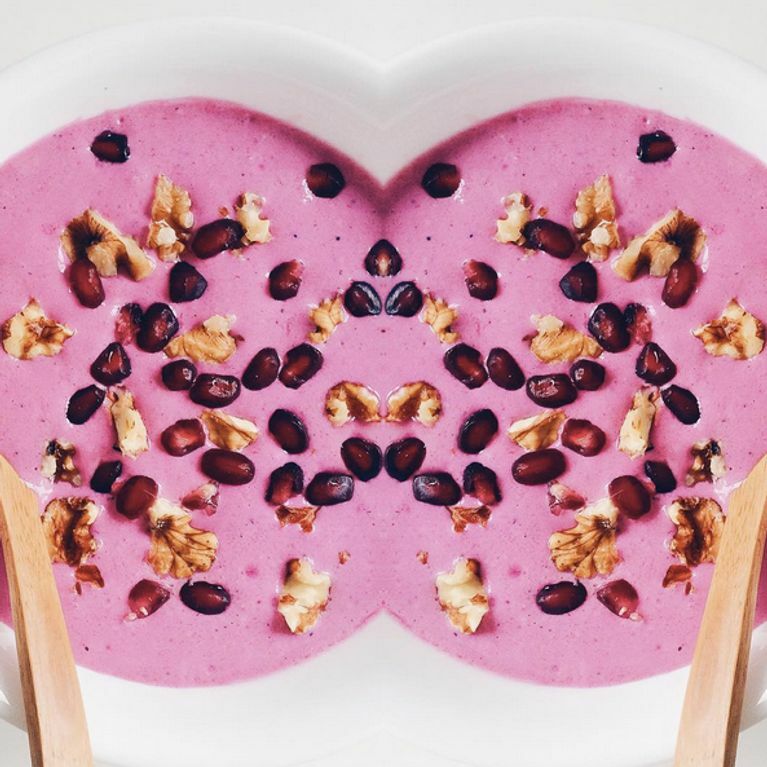 Take a look at these pretty pitaya recipes below for some pitspiration. What's better than eating peanut butter without having to deal with that horrible brown-beige colour? Get the recipe here. Appealing to pink ladies young and old! Recipe here. If you love fruit, it's pretty much a given you're going to enjoy the hell out of this version. You know what to do, recipe here. Go exotic by chucking some delicious greek yoghurt in your bowl and top it with a smattering of toasted pecans. Delish. Recipe here. Get that vegetable goodness in there without even a hint of that kale taste. Who said healthy couldn't be tasty? Recipe here. Although the hot summer days are probably behind us now, there's never a bad excuse to indulge in an ice lolly! And with these pitaya pops, the word 'indulge' needn't come into the equation - it's basically a frozen pitaya bowl! Amazing. Get the recipe here. This pitaya drink is delicious and refreshing, and contains just three ingredients: pitaya, club soda and lemon juice. And maybe a splash of gin. Or not. I mean, we're not encouraging you to drink. Or are we.... Recipe here. Whilst we can't quite imagine what mint and pitaya tastes like together, we're trusting these guys - their taste game seems strong. Plus, who can resist a breath of minty freshness when they wake up in the morning. Lovely. Recipe here. Aah, avocados. Another hipster favourite. This combination of pitaya and avo means you're getting an insane amount of nutrients. Probably too many nutrients. (Only kidding - there's no such thing!). You can find the recipe here. If you've just completed a particularly heinous workout, then this is the perf pick-me-up for the post-gym slump. Recipe here.